Why pay the additional cost of new costly frames for your regular eyeglasses or sunglasses along with the cost of new lenses just because of a broken, cracked, or scratched lens. Save some money by only purchasing replacement lenses for that perfectly good eyeglasses frame or for your favorite eyeglass frames which you don’t want to discard. Replacement lens are also the way to go for vintage frames that often are bought without lenses. Crystal Vision can help you if you own a pair of glasses frames that just need to have the lenses replaced. How? 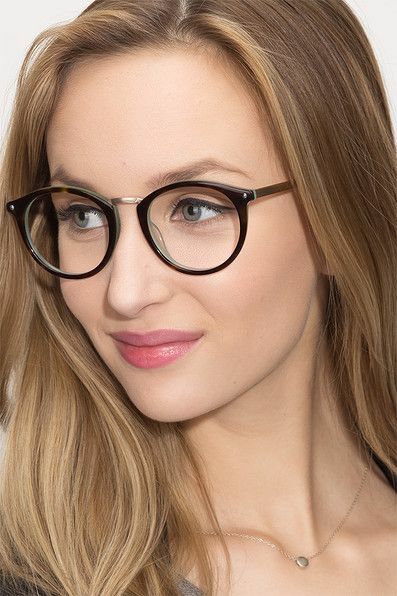 By clicking this link to our sister site at eyeglasses.com, you can easily choose and order the best replacement lenses for your lifestyle and needs. If after reading the information below, you are still unsure of what type of eyeglasses replacement lenses would be best for your frames and needs, give us a call. Choosing replacement lenses can appear complicated due to the numerous options available, but our knowledgeable customer service representatives are here to help. For us to make the proper replacement lens, we need either an actual prescription from your eye doctor or the lenses you need replaced so we can duplicate the lenses’ current. NOTE: The lenses must be the same ‘Lens Type’ that you will be ordering. If you are changing prescriptions or the eyewear frame you plan to send us has lenses with an old, outdated prescription, we will need your new prescription information. We also need your “PD” Pupillary Distance measurement. Don’t know your PD? When you go to your optometrist for an eye exam, request your Pupillary Distance measurement. Often an optician where you have had other lenses fitted for glasses frames will already have your PD record. Request it from them. You now need to choose your lens type: single vision, bifocal, trifocal, or progressive. 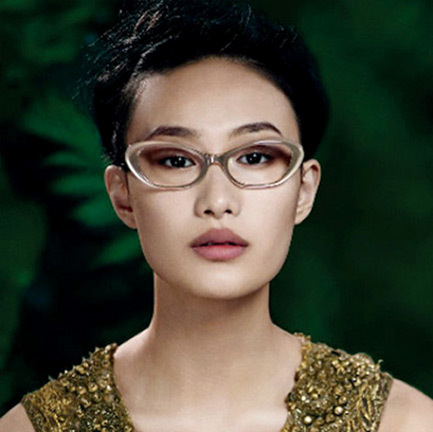 Your eyeglass frames: full rim, half rim or rimless may limit the type of lens you can select. Unlike single vision lenses which have only one vision focal power ground into them, bifocal, trifocal, or progressive replacement lenses have more. Having the same focal power throughout the lens from top to bottom, single vision lenses can help correct a number of eye disorders including nearsightedness, farsightedness, and astigmatism. Single vision are the simplest of eyeglass lens types, the least expensive replacement lens, and the most common type lenses found in glasses for people under the age of forty. Single vision replacement lenses are great for those who need glasses just for long distance, intermediate distance such as for computer glasses, or near distance such as for reading or other close up work. Bifocal lenses are divided into two sections with different focal powers to correct for distance and near vision deficiencies. The upper section of a bifocal lens is normally used for distance focal vision, while the lower section is used for near vision tasks such as reading. These lenses usually have a “demarcation line” which denotes the separation between the distance viewing lens above and the near viewing lens below. The demarcations lines in bifocal lenses are visible. However, with advances in bifocal lens designs, consumer have other shape choices for the near vision correction component of bifocal lenses. The half-moon or flat top segment is the most popular bifocal lenses. Another option is a “round” near vision correction component segment, in which the entire bottom half of the lenses has the near vision correction component. Who uses bifocal replacement lenses? – When someone needs glasses for distance, as well as near vision, but only wants to use one pair of glasses rather than two different glasses, bifocal glasses are a good choice. – People over the age of forty-five who have presbyopia, a deterioration in the ability of the eye’s natural lens to expand or contract in order to focus on close up objects, often choose bifocal replacement lenses. They might need correction only for their near vision, but not for longer distances, but don’t want to keep removing their reading glasses repeatedly to meet the frequently changing demands of looking at distant objects and near objects. In these cases the bifocal lens could have a plain (no power) upper segment since the wearer has no need for long distance correction, while the near-vision correcting power in the lower segment of the lenses meets their needs perfectly. If, however, the intermediate distance vision is not totally in focus then progressive lenses might be the better solution since they provide a seamless progression of many lens powers for all the viewing distances. Trifocal lenses, as their name implies, is a multi-focal spectacle lens with three focal points, usually for close up, intermediate (arms’ length), and distance vision. The two demarcations lines between the three viewing zones in trifocal lenses are visible. Trifocals aren’t customizable like progressives lenses, although they come in a few standard configurations including a wider intermediate viewing area. Progressive lenses, often referred to as no-line bi-trifocals, eliminate the visible demarcations lines of traditional bifocals and trifocals lenses. Progressive replacement lenses provide a seamless progression of the lens powers for all the viewing distances: close, intermediate, and distance. This type of lens offers a more natural correction of presbyopia than either bifocal or trifocal prescription eyeglasses. 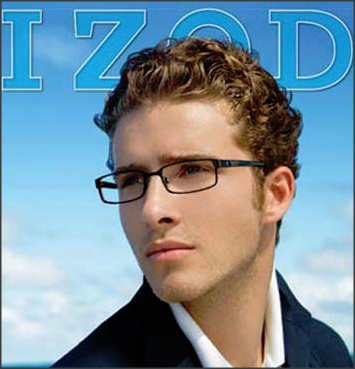 As a result, progressive lenses are the most attractive lens (no lines) to wear and very popular. However, it may take time and a few adjustments to get used to progressive lenses. We suggest that rather than moving your eyes to focus on an object that you initially point your nose at what you want to see and then tilt your chin to focus. Usually within a few hours to two weeks, you will have adapted to progressive lenses and find that they provide a more natural transition between lens powers than either bifocals or trifocals whose lines can cause a jump in an images as you move from one viewing zone to another. Replacement lenses are made from several different types of materials: plastic, polycarbonate, hi-index, or glass. It is important to understand the advantages and disadvantages of each material, so that you can determine which would be best for your visual needs. Note that your eyewear lens material determines how well those lenses will perform in everyday situations. Originally, eyewear lenses were only made from glass. Although you are able to still buy replacement lenses made from glass, they are substantially heavier and more expensive than lenses made from plastic. On the plus side, glass lenses are optically clearer than plastic, as well as being extremely scratch resistant. However, even though in accordance with FDA regulations, glass lenses are safety hardened, they are more likely to crack than plastic lenses. Fifty percent lighter than glass lenses, standard plastic replacement lenses are the least expensive material from which eyewear lenses are made. However, to provide the high optical quality of standard plastic lenses (CR-39), they offer less strength and reduced durability. Consequently, if plastic lenses are not properly taken care of, they will become scratched, resulting in a loss of some of their visual clarity. At Crystal Vision, we recommend that a scratch resistant coating is applied to plastic lenses for protection against scratches. Ten times more impact resistant than standard plastic lenses, polycarbonate replacement lenses are ideal for everyday wear for several reason. Polycarbonate lenses are not only tough, shatterproof or impact resistant, but also lightweight. Another plus for considering polycarbonate lenses is that unlike regular glass lenses, they block 100 percent of the sun’s UV rays without the need for special UV- blocking lens coatings. However, due to their flexibility or softness, which makes them so impact resistant, all polycarbonate lenses need a scratch-resistant coating to prevent surface scratches. Distance vision lenses, progressive lenses, bifocal lenses, trifocal lenses, lenses for reading and lenses for computer work are available in polycarbonate. One the newest developments in eyewear material is Trivex replacement lenses which hold their own when compared to polycarbonate replacement lenses. For ultimate comfort, Trivex lenses are some of the thinnest lenses available with the least amount of visual distortion around the lens’ edges. About 10 % thinner and 10 % lighter than polycarbonate lenses, Trivex lenses are shatterproof or impact resistant. However, they also need a scratch-resistant coating to prevent surface scratches. The high-tech scratch-resistant coatings make the surface of Trivex lenses nearly as hard as glass. Distance vision lenses, progressive lenses, bifocal lenses, trifocal lenses, lenses for reading and lenses for computer work are available in Trivex. What is the significance of the refractive index of a lens material? Lens index is a number that describes how thick or thin lenses are. Simply put, the higher a lens’ index, the thinner the lens is. Higher prescriptions require higher index lenses, while lower prescriptions require lower index lenses. The difference among a glasses’ lens index can make a huge impact on the wearer, yet the index itself is often determined by the persons’ prescription. The “index” that is being referred to is the refractive index of a lens material. The higher the index number of a given lens material, the more the light will refract as it enters. If a lens material has a greater ability to refract light, less of a curve is required to obtain a specific power. Less curve results in a thinner eyeglass lens. Both the standard plastic referred to as CR-39, and glass are considered base or low index. CR-39 plastic lenses have an index of 1.498 while for lenses made from glasses have an index of 1.52. Conventional single-vision lenses have an average 1.5 index lens. When you find eyeglasses lens index more than 1.58 or greater, the lens is considered high index. High index replacement lenses are made from glass and a variety of plastic materials. The lens are thinner, lighter, as well as more scratch-resistant than standard plastic, or polycarbonate lenses. However, as the index increases up to around 1.74 which is about as thin as possible, the lens hardness increases and they become more brittle and less impact-resistant. Because of are their highly reflective nature, which results in some glare and distortion and along with their higher cost, high index lenses require anti-reflective coating to avoid distracting and vision-compromising glare. Some activities that require impact resistant eyewear are not suitable for high index lenses. People choose a high index lens for a number of reasons ranging from their lighter weight, their reputation as being some of the highest quality lenses you can order, the thinness looks better in eyeglass frames to following their optometrist recommendation. And those are all valid reasons. However, consider your lifestyle before making a choice. After choosing a lens type (single, bifocal, trifocal, progressive) and lens material (glass, standard plastic, polycarbonate, Trivex hi-index plastic), you now have several options to consider for your replacement lenses to make them more durable and comfortable to wear. All will protect and /or enhance your replacement lenses in some way. •	UV Coating to protect your eyes from the sun’s ultraviolet rays. The lens options available may differ depending upon which specific replacement lenses you chose to buy. Why discard a perfectly good pair of sunglass frames just because you need to replace the lenses. And if you have bought a fabulous pair of vintage sunglasses that need lenses, Crystal Vision can install them. We offer various tint options for your sunglasses replacement lenses ranging from regular sunglasses tints in a variety of colors and densities, to fashion tints in most fashion colors that go from a light density tint 15% to a dark density tint of 35%, as well as gradient tints. Still unsure about which lens type, material and additional options are best for your life style, give us a call. Our knowledgeable customer service representatives are here to help. Uncompromising quality, at a reasonable price – guaranteed. Crystal Vision Lensessm are prescription lenses for eyeglasses and sunglasses, which represent a full portfolio of highest quality lenses, all of which carry a Satisfaction Guarantee, a Perfect Lenses Guarantee, and a two year manufacturers warrantee. Have you ever wondered why prescription lenses are so expensive in retail optical stores? Or why you can buy cheap or free prescription lenses on the internet? The answer to these questions is that many retailers overcharge, or provide low quality lenses, or both. Crystal Vision Lensessm is a brand that provides a reliable standard, so that customers are guaranteed of getting a high quality product with a reasonable profit margin for the retailer. A great quality piece of plastic (or glass). A good optician getting the right pupil distance and segment height from your face. A great lens laboratory customizing a great piece of material to your personal needs. If you have a good doctor and optician, we take care of the other two. Crystal Vision Lensessm are designed by retail optical industry people who are passing on to you an important secret: Great lenses are made by Essilor, Zeiss, Pentax, Seiko, and others but they cost more when their brand names are attached to the lenses. Crystal Vision Lensessm are supplied by the world’s best lens makers, but we can offer them at lower prices IF WE DON’T TELL YOU WHICH ONES. This is referred to as “private label”, a common practice in the garment industry. A great piece of plastic (or glass) is worthless if not carved perfectly by an experienced craftsman. Crystal Vision Lensessm are made in a state-of-the-art laboratory in the U.S.A. in a partnership with a world leader in eyeglass lenses (but we can’t tell you which one). 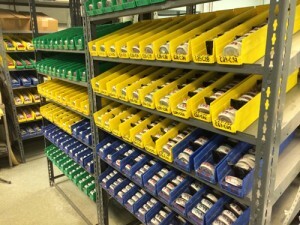 Every lens goes through up to 20 different quality control checkpoints. Follow this link to see photos of our lab. Crystal Vision Lensessm represent a diverse portfolio of lenses for every purpose, and (almost) any prescription. Follow this link to find the perfect lens for your needs. Replacing your eyeglass lenses with the same prescription, or a new prescription, is easy to do. You can mail your eyeglasses to an Authorized Crystal Vision Lensessm retailer, who will install the lenses and mail it back to you. Follow this link to find an Authorized Crystal Vision Lensessm retailer. Eyeglass lenses replacement is perfect for mail-order, because your eyeglass frames already have lenses with your old prescription and all the other measurements we need to install perfect eyeglass lens replacements. All you have to do is mail your glasses in to us, and we will install the replacement lenses. We have been installing mail-order eyeglass lens replacements for 16 years, and we only use the highest quality materials, and the finest lens laboratory in the country. Crystal Vision Lenses replacement eyeglass lenses are easy to order. Just send your glasses and your new prescription to us, along with your phone number, and an optician will call you to discuss the best, high quality lens choices and options for your needs. Or, you can use the lens selector to read all about your lens choices, make your own decision, place the order, print out the invoice, and mail it with your glasses to us. You will receive a free shipping label to send your glasses in. If you have any questions about ordering your replacement eyeglass lenses for glasses, feel free to call our customer service at (888) 896-3885, or send email to us at [email protected]. A trained professional will quickly respond to you to answer all of your questions. In the meantime, there is a lot of information on this website that you can read and educate yourself about replacing your own glasses lenses. Nowadays, there really is no reason to go into a local store to replace your lenses, because the prices will be much higher. Our lens quality is better than most optical stores, our prices are lower (because we do not have to pay for a storefront), and we are usually faster as well. Don’t hesitate, get started right away to send in your glasses to receive your replacement lenses. We offer all kinds of replacement lenses, including single vision, progressive, bifocal, trifocal, Varilux, and Transitions replacement lenses. Our replacement lens materials include plastic and polycarbonate, super-thin high index , and even Zeiss glass lenses. You can also order replacement prescription sunglass lenses with custom tint, Transitions technology, polarized, and mirror coated lenses. All of our replacement lenses come with a “Perfect Lenses Guarantee” so if they do not work for you, we will redo them or refund you in full. Replacing your eyeglass lenses by mail-order gives you the best quality glasses lenses at the best available price. However, there are many cheap and low quality lens services and so it is very important to order from a company like ours, which offers only name brand lenses, with a full guarantee, 16 years of history making lenses, and an A+ rating from the Better Business Bureau. Your lenses will be made in the United States, and every lens order goes through over 20 quality control checkpoints to ensure that your lenses will be perfect. Do not accept low quality substitutes for your vision. At Crystal Vision Lenses, quality is paramount and we pride ourselves on providing the best available quality lenses at the most reasonable price. Eyeglass lenses by Crystal Vision Lenses are available in all the major categories, in prescription and non-prescription, custom made eyeglass lenses. All of our prescription eyeglass lenses are made in the USA, in our lab in partnership with one of the world’s largest lens makers. The first thing to look at is the lens purpose – single vision or multifocal. Then, look at the strength of your prescription, which will help to determine the lens material to choose. Then you can choose the actual lens, after which you can select the options that are available for that lens. Single vision lenses have one viewing area throughout the lens, and are used mostly for distance vision, but also for computer and reading lenses. Multifocal lenses have more than one viewing area. In the case of progressive lenses, there is a distance area at the top, a reading area at the bottom, and a continuous intermediate vision area in the middle. All of these areas are connected seamlessly, so there are no visible lines. Bifocal and trifocal lenses have two or three viewing areas, and they are separated by a visible line. If you are looking for prescription sunglasses, you will first select the actual lens, and then add the tinting options. Tinting comes in the form of a solid or gradient tint, Transitions (clear indoors and dark outdoors), and polarization. Of these, only the regular tint is customizable; Transitions and polarized lenses are only available in the colors and density as shown. Single vision lenses are the most common lenses, both for new eyeglass frames and for eyeglass lenses replacement, although in the last 20 years with the advent of progressive lenses, single vision lenses have lost some of their popularity. Single vision lenses are very relaxing to wear compared to multifocals, because your eye has maximum movement to see through the lens with good vision, and also offers the best peripheral vision compared to multifocal lenses. Single vision lenses also refer to lenses used for reading and computers. A custom reading lens made for your exact pupil distance, correction, and astigmatism will significantly improve your interaction, whether it be with a book or a computer. For people that are on the computer all day, a single vision lens is the perfect choice. Plastic lenses offer the best optics compared to higher index lenses, and only glass lenses have a better visual acuity. Our plastic lenses have an index of 1.56 and, like all Crystal Vision Lenses, they come with a scratch resistant coating at no extra charge. However, for prescriptions that are stronger than +/-4.00, plastic lenses become somewhat thick, heavy, unsightly, and most people tend to switch to a higher index alternative like polycarbonate or super high index. Plastic lenses are a great choice for most people, and offer a wide range of coatings and other options to fit any need or requirement. Crystal Vision polycarbonate lenses have an index of 1.59 and are a great choice for prescriptions that range from +/-4.00 to +/-6.00. Polycarbonate lenses are virtually shatterproof, and are the lens of choice for children, youths, and sporting activities for any age person. Our polycarbonate lenses are ultra clear and light, with a minimum of aberrations that are visibly evident in inexpensive and low quality lenses. We offer a regular polycarbonate lens, and also an HD Digital polycarbonate lens both in single vision and in progressive. Crystal Vision higher index lenses are available in 1.67 index and also in 1.74 index. We recommend the 1.67 index lens for prescriptions that range from +/-6.00 to +/-9.00, and we recommend the 1.74 index lens for prescriptions that are higher. With a high prescription, it is always recommended to add some kind of anti-reflective coating, because as the index goes up, so does the density of the lens, which increases the amount of reflected light, therefore increasing eye strain and reducing visual acuity. Trivex is a relatively new material in the lens market, and it serves a good purpose for some situations. It is the toughest material on the market, so it is recommended for rimless eyeglass frames – frames that have no rim over the top or under the bottom. Using Trivex, rimless frames will not crack the lenses, a problem that is often seen when plastic or polycarbonate lenses are used in rimless frame types. Trivex material also offers better visual acuity than polycarbonate or high index lenses, due to its advanced chemical composition. Crystal Vision glass lenses offer the finest clarity of any glass lens on the market today. Glass, by virtue of its density, is by definition a clearer lens than any plastic or polycarbonate lens. The downside is that it is heavier than plastic, and also it could shatter under extreme duress. Also, glass lenses take significantly longer to process than plastic lenses, from 2-4 weeks on average, due to the stringent “drop ball” testing imposed by the United States FDA. Every lens is tested to be sure that it will provide the minimum level of impact protection. Glass lenses are available in regular, and high index versions; regular lenses are good for prescriptions up to +/-3.00, and high index is good for prescriptions up to +/-7.00; above that, and the lens becomes so thick and heavy that it is not recommended for use. Progressive lenses were invented about 20 years ago by Essilor, the worlds leading lens making company, and the creator of Crizal. Many people love progressive lenses because they are multifunctional: they can be used for all-around use to see in the distance, nearby, or intermediate ranges. If you can only have one pair of eyeglasses, and you need some extra power in the close up ranges, the progressive lens could be a good choice. In addition, the progressive lens design offers a continuous mid-range vision, which is unavailable in single vision lenses. The most important reason that most people use progressive lenses is not functional, but cosmetic: many people do not like the look of a visible line in the lens because it makes them look “old”. However, progressive lenses do have some drawbacks. The most significant drawback is adaptation: in order to make a progressive lens, plastic is built up in the side corners of the lens and you cannot see through these areas. You can only see through an hour-glass shaped area in the middle of the lens, which forces you to turn your head from side to side instead of the more-natural eye-turn movement that we are used to. People need to train themselves to learn how to see differently, and if you are not able to do that, you may get headaches, double vision, and poor vision. It usually takes 2-4 weeks for a person new to progressives to learn how to use them and if they do not “adapt”, they are forced to revert to single vision lenses or bifocals. Progressive lenses are also considerably more expensive than single vision lenses, which makes them the best candidate for eyeglass lenses replacement by mail-order. Progressive lenses in regular retail store start at about $200 and can go well over $1,000 per pair, so by ordering replacement lenses you can save $100 to $500. For people that work in an office, the cost of a dedicated pair of glasses for computer use may not be more expensive than a single pair with progressive lenses. Plastic lenses offer the best optics compared to higher index lenses, and only glass lenses have a better visual acuity. Our progressive plastic lenses have an index of 1.56 and, like all Crystal Vision Lenses, they come with a scratch resistant coating at no extra charge. However, for prescriptions that are stronger than +/-4.00, plastic lenses become somewhat thick, heavy, unsightly, and most people tend to switch to a higher index alternative like polycarbonate or super high index. Plastic lenses are a great choice for most people, and offer a wide range of coatings and other options to fit any need or requirement. Crystal Vision progressive polycarbonate lenses have an index of 1.59 and are a great choice for prescriptions that range from +/-4.00 to +/-6.00. Polycarbonate lenses are virtually shatterproof, and are the lens of choice for children, youths, and sporting activities for any age person. Our polycarbonate lenses are ultra clear and light, with a minimum of aberrations that are visibly evident in inexpensive and low quality lenses. We offer a regular polycarbonate lens, and also an HD Digital polycarbonate lens both in single vision and in progressive. Crystal Vision progressive higher index lenses are available in 1.67 index and also in 1.74 index. We recommend the 1.67 index lens for prescriptions that range from +/-6.00 to +/-9.00, and we recommend the 1.74 index lens for prescriptions that are higher. With a high prescription, it is always recommended to add some kind of anti-reflective coating, because as the index goes up, so does the density of the lens, which increases the amount of reflected light, therefore increasing eye strain and reducing visual acuity. Trivex is a relatively new material in the progressive lens market, and it serves a good purpose for some situations. It is the toughest material on the market, so it is recommended for rimless eyeglass frames – frames that have no rim over the top or under the bottom. Using Trivex, rimless frames will not crack the lenses, a problem that is often seen when plastic or polycarbonate lenses are used in rimless frame types. Progressive Trivex material also offers better visual acuity than polycarbonate or high index lenses, due to its advanced chemical composition. Crystal Vision progressive glass lenses offer the finest clarity of any glass lens on the market today. Glass, by virtue of its density, is by definition a clearer lens than any plastic or polycarbonate lens. The downside is that it is heavier than plastic, and also it could shatter under extreme duress. Also, glass lenses take significantly longer to process than plastic lenses, from 2-4 weeks on average, due to the stringent “drop ball” testing imposed by the United States FDA. Every lens is tested to be sure that it will provide the minimum level of impact protection. Glass lenses are available in regular, and high index versions; regular lenses are good for prescriptions up to +/-3.00, and high index is good for prescriptions up to +/-7.00; above that, and the lens becomes so thick and heavy that it is not recommended for use. 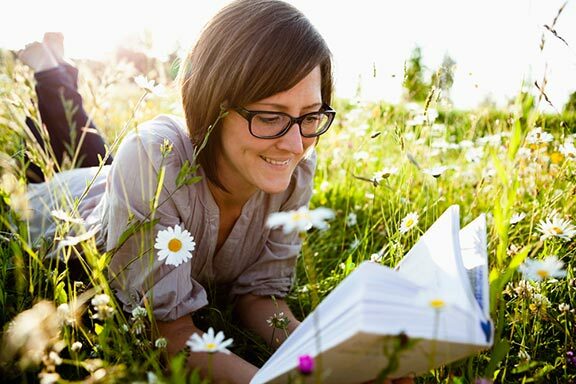 Bifocal lenses offer two viewing areas for distance and reading purposes. The reading area is visible and delineated by a line or lines. This makes it easy to find the reading area, but if you do not want other people to see that you are wearing multifocal lenses, you should choose progressive. Bifocal lenses are also less expensive than progressive lenses, but still cost more than single vision lenses. As a result, eyeglass lenses replacement with bifocal lenses could result in significant cost savings. Bifocal lenses are easier to use than progressive lenses, and do not have the adaptation period. Also, you can see through any part of the lenses – there are no blurry areas like in progressive lenses. Bifocal plastic lenses offer the best optics compared to higher index lenses, and only glass lenses have a better visual acuity. Our bifocal plastic lenses have an index of 1.56 and, like all Crystal Vision Lenses, they come with a scratch resistant coating at no extra charge. However, for prescriptions that are stronger than +/-4.00, plastic lenses become somewhat thick, heavy, unsightly, and most people tend to switch to a higher index alternative like polycarbonate or super high index. Bifocal plastic lenses are a great choice for most people, and offer a wide range of coatings and other options to fit any need or requirement. Crystal Vision bifocal polycarbonate lenses have an index of 1.59 and are a great choice for prescriptions that range from +/-4.00 to +/-6.00. Polycarbonate lenses are virtually shatterproof, and are the lens of choice for children, youths, and sporting activities for any age person. Our bifocal polycarbonate lenses are ultra clear and light, with a minimum of aberrations that are visibly evident in inexpensive and low quality lenses. We offer a regular polycarbonate lens, and also an HD Digital polycarbonate lens both in single vision and in progressive. Crystal Vision bifocal higher index lenses are available in 1.67 index and also in 1.74 index. We recommend the 1.67 index lens for prescriptions that range from +/-6.00 to +/-9.00, and we recommend the 1.74 index lens for prescriptions that are higher. With a high prescription, it is always recommended to add some kind of anti-reflective coating, because as the index goes up, so does the density of the lens, which increases the amount of reflected light, therefore increasing eye strain and reducing visual acuity. Trivex is a relatively new material in the progressive lens market, and it serves a good purpose for some situations. It is the toughest material on the market, so it is recommended for rimless eyeglass frames – frames that have no rim over the top or under the bottom. Using Trivex, rimless frames will not crack the lenses, a problem that is often seen when plastic or polycarbonate lenses are used in rimless frame types. Bifocal Trivex material also offers better visual acuity than polycarbonate or high index lenses, due to its advanced chemical composition. Crystal Vision bifocal glass lenses offer the finest clarity of any glass lens on the market today. Glass, by virtue of its density, is by definition a clearer lens than any plastic or polycarbonate lens. The downside is that it is heavier than plastic, and also it could shatter under extreme duress. Also, glass lenses take significantly longer to process than plastic lenses, from 2-4 weeks on average, due to the stringent “drop ball” testing imposed by the United States FDA. Every lens is tested to be sure that it will provide the minimum level of impact protection. Glass lenses are available in regular, and high index versions; regular lenses are good for prescriptions up to +/-3.00, and high index is good for prescriptions up to +/-7.00; above that, and the lens becomes so thick and heavy that it is not recommended for use. Eyeglass lens coatings and options are all dependent on the base lens that you choose, and to a lesser extent, the frame style. The more lens options you choose, the more the price goes up, and thus increases your savings if you choose to do eyeglass lenses replacement by mail-order. Coatings and options can add up to hundreds of dollars in addition to the base cost of the lens, so you can save a significant amount of money by mailing in your frame to receive replacement eyeglass lenses. Our glasses lenses are made of the highest possible quality by the world leader in eyeglass lenses. We are able to guarantee perfection in our glasses lenses because we use the best lens laboratory. If you want the fastest lenses, or the cheapest glasses lenses, then you should not order from us. We always value perfection over speed. That said, we make most lenses in 1-4 days, and sometimes higher if they include specialty lens coatings. Making perfect lenses for glasses is both a science and an art. All of our glasses lenses are made by our partner lab which has over 60 employees involved in making every pair of lenses. So when you ask us to make your lenses, you are getting an entire team of professionals working on your lenses. You are not hiring one person to make your glasses in the back room of an optical store. You will receive the best plastic (or glass) lens, installed in a quality controlled, ISO 9000 lens-making laboratory. Your lenses pass through over 20 quality control checkpoints before they are finally released. If any imperfection is noticed at any of those checkpoints, the lenses are scrapped and a new pair is created. Perfect lenses, guaranteed. Our partner is the world leader in eyeglass lenses, and the creator of the first and best progressive lens – the Varilux family. (Varilux lenses, Varilux Definity®, Varilux Comfort®, Varilux Physio®, Varilux Ellipse®) They also invented the finest lens coating (Crizal®), and the finest single vision lenses on the market today (Orma®, Thin&Lite®, and Airwear®). Depending on the type of lens you order, we may also supply a Zeiss®, Transitions®, Younger&reg, Trivex®;reg, Kodak®;reg, Pentax®;reg, Sola®, Hoya®, or other lens brand. But to make the perfect lenses for glasses, the actual lens material is only half of the battle. The other half is the lens installation. Even if you are supplied with the best lens material, a poor installation by a technician will result in lenses that offer poor vision and you will have wasted your money. With Crystal Vision Lenses, you can be assured that you are getting the exact lens you ask for, and it is being installed with the very highest skill, attention to detail, and quality control. 4) The accuracy of the cutting of the lens to fit your frames. Several people are involved in the making of glasses lenses. If any one of these people makes a mistake, a loss in vision correction in the lenses will result. The store you choose to make your lenses must insist on quality at every level in order for you to receive the best quality product. This kind of quality control is essential in order to ensure consistent results. –The brand of lenses determines the clarity of the plastic: Essilor, Zeiss, Pentax, Seiko, many others. –The lens carver of the plastic determines the precision of the lenses. 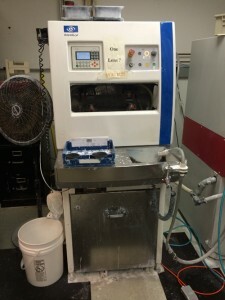 The plastic maker does the surfacing for stock lenses. The lens laboratory does the carving for surfaced lenses. –Your eye doctor determines the prescription for the lens such that it will work best for your eyes’ condition. Optometrist tend to write more accurate prescriptions than ophthalmogists. It is not uncommon for an eye doctor to change a prescription if the first prescription is not taken carefully, while laying the blame on the maker of the eyeglass lenses. –An eyewear store employee measures the pupillary distance. Your eye doctor may not write the pupil distance measurement on your prescription unless you ask, in an effort to prevent you from buying glasses lenses at a different store. This is an illegal practice. –The person that carves the eyeglass lenses for your frame installs lenses so that the optical centers match the pupillary distance measurement. This could be an eyewear store employee, or lens laboratory. Eyeglass lenses begin their life in large, hockey-puck-like large pieces called “blanks” which about four inches in diameter and about half an inch thick. There are different types and qualities of blanks. The quality of the blank is determined by the clarity, meaning the absence of small bubbles or inconsistencies which can only be seen with a microscope. The lower lens quality and less expensive plastics have more miasms that, although you cannot see them with the naked eye, can still add up to decreased visual acuity. Crystal Vision Lenses only use better or best quality lens plastic made by well-known plastic suppliers. 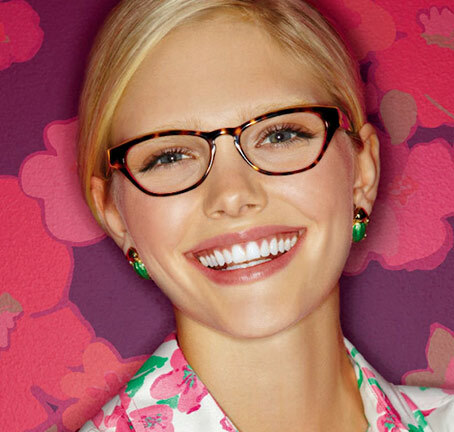 It is very easy for any eyewear retailer to cut their lens costs by 50% by switching to lower quality lens suppliers. We inspect every lens that we receive several times to ensure that it meets our standards. All of our suppliers have unconditional return policies for defects in lens quality. There are two basic ways of cutting lenses, depending on the prescription. Most prescriptions fall within a standard range, called the stock range (on average the range is +/-8.00 sphere and up to +2.00 cylinder). 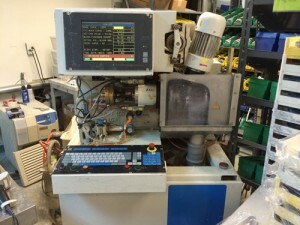 Single vision lenses that are in the stock range are usually surfaced by the plastic makers in bulk by huge computerized machines. 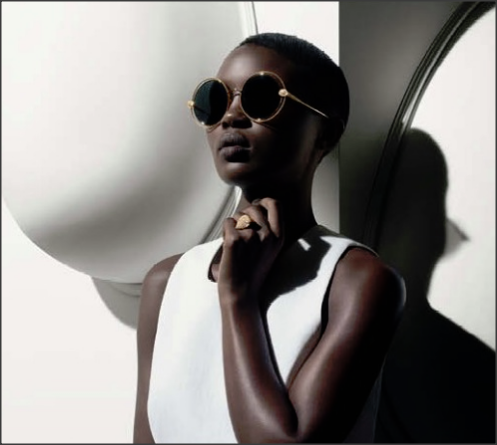 These lenses are then shipped to optical stores so that the store employees can edge the lenses into the frame. Most multifocal lenses, and all lenses that fall outside of the stock prescription range, must be fashioned custom for each prescription. In these cases, plastic blanks (chunks of plastic) are shipped to lens laboratories where they are carved (surfaced) for each individual prescription. 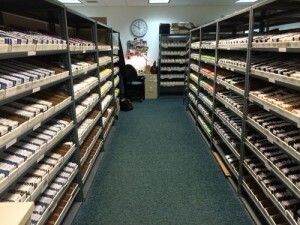 There are hundreds of lens laboratories around the country, several in each state. A typical lens laboratory will do a minimum of a few hundred lenses a day with a large staff of highly trained and experienced technicians. A few optical stores (like Lenscrafters) have small surfacing facilities in each of their stores doing much smaller lens volume. To surface a lens, the lens laboratory takes the blank and puts it through a series of grinding machines, which grinds the surface the lens and shapes it exactly to the specifications of the prescription. Lens laboratories also provide other services like edging and mounting, which optical stores can choose to use or not, depending on whether they want to do that work themselves. 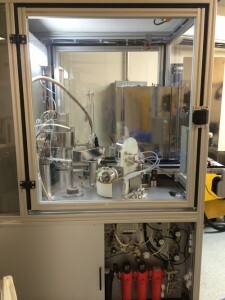 As with any custom service, the quality of the surfacing and any other services that the lab provides– is determined by the experience and the expertise of the laboratory, its personnel, and the equipment it uses. We only use labs that employ a large staff of highly trained technicians, doing a large volume of lenses every day. 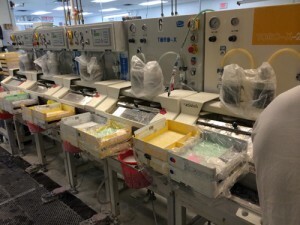 At Eyeglasses.com, we do none our own edging services ourselves, and all of it is done by our lens laboratories. Most of our orders require stock lenses; all of our custom surfacing work is done by lens laboratories. The laboratories that we use each have many years of experience and do thousands of lenses each week. 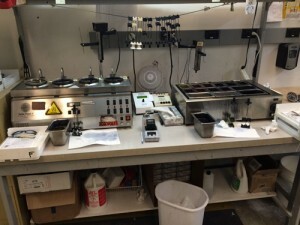 Each lab that we use inspects each lens several times during the manufacturing process. When we receive the finished product from the lab, we do our own final inspection. The optometrist (OD) or ophthalmologist (MD) that issues the prescription is not involved in the fashioning of the lens, but the prescription they issue is crucial to the overall effectiveness of the lens. Occasionally the OD or MD can issue a prescription that is not quite right. Also, it is possible for your eyes, and your prescription, to change rapidly during some stages of your life. Pupillary Distance PD Measurement: Who Measures It? Normally an optical store employee will take your PD measurement when you go to buy glasses. If you want more freedom to choose where to buy your eyeglasses, you should ask your optometrist or ophthalmologist to measure the PD during your exam. Usually they will not measure the PD unless you ask them to. If you have your PD measurement and your prescription when you leave your eye doctors office, then you can buy glasses and lenses at any eyewear store. With your PD and your prescription, you will not be forced to go to an optical store to get your PD measurement, and then feel obliged to buy glasses from that store. Edging Lenses: Who Does That? Edging is performed in a number of different ways. It can be done at the lens laboratory, or in the optical store. Either way, it is not required in any state that the edging be done by a licensed person. About one-half of the states in the United States have opticianry laws. In those licensed states, edging can be done by an unlicensed person that is “overseen” by a licensed person. The edging for most glasses made in this country is not performed by a licensed professional. 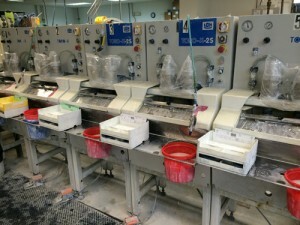 However, all of the edging that is done for Eyeglasses.com is done in a state-of-the-art lens laboratory. When we ask our laboratory to do the edging, it is done by an employee/tradesman that does at least hundreds of jobs per day. That person has a very high skill and accuracy level that we have found to deliver very high quality.